The Jefferson Lab Detector and Imaging Group in collaboration with Oak Ridge National Laboratory (Dr. Justin Baba), Johns Hopkins University (Dr. Martin Pomper) and the University of Sydney (Dr. Steve Meikle) is developing an imaging methodology that utilizes SPECT and X-ray CT for small animal research. The primary challenging task of this project is to develop a SPECT imaging system to allow molecular imaging of unrestrained and un-anesthetized mice. 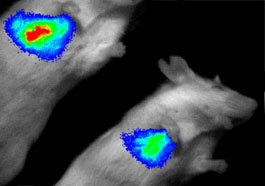 Present methods of performing SPECT imaging with mice require the animals to be anesthetized or physically restrained during image acquisition. Both methods of restraint have the potential to interfere with the physiological and neurological processes being investigated. In the initial focus of the project, tracking of the orientation and location of the mouse's head during SPECT imaging is accomplished through a pair of CMOS optical cameras that image IR retro-reflectors attached to the mouse's head. The gamma-ray projection data is reconstructed into a fixed small animal reference frame based on the time-varying animal orientation data. The goal is to develop instrumentation to acquire high-resolution volumetric SPECT images of the head region of an unrestrained, un-anesthetized mouse and to register these image volumes with microCT data sets of the same mouse acquired before or after the SPECT scan. The animal will be anesthetized during the microCT scan. Jefferson Lab is coordinating the entire effort and is developing high spatial resolution gamma cameras 10 cm x 20 cm in size for the SPECT system. The system is installed in the animal research facility at Johns Hopkins University where it is being tested with awake mice. Dedicated positron emission mammography (PEM) systems potentially provide a high sensitivity, high resolution alternative to whole body PET for positron breast imaging. In collaboration with Duke University Medical Center (Tim Turkington, PI), we have designed, built and evaluated a large field of view (15 cm x 20 cm) PEM system. The device is built with a set of two pixellated LGSO/LYSO crystal scintillators coupled to arrays of compact position sensitive photomultiplier tubes. In pre-clinical trials performed at Duke lesions as small as 4 mm were seen in phantom experiments using advanced iterative image reconstruction algorithms developed at Jefferson Lab. Subsequent clinical trials at Duke supported by the DoD (Eric Rosen, PI) showed that small primary breast malignancies can be imaged. An NIH-funded clinical study at Duke is underway to scan 200 patients with suspected breast cancer (Mary Scott Soo, PI). The purpose of this collaboration between the University of Florida (UF; David Gilland, PI), the University of South Florida (USF; Claudia Berman, Maria Kallergi, PIs) and Thomas Jefferson National Accelerator Facility (Jefferson Lab) is to design, build and evaluate compact, mobile, high resolution gamma ray and positron medical imaging devices. The targeted applications are molecular imaging of heart disease and breast cancer. Mobile gantries with articulated arms will position the imaging cameras close to the body. These compact, portable instruments will be suitable for organ-specific imaging in space-limited settings such as emergency rooms and surgical suites. Design and prototype studies of a compact, mobile bedside positron heart imager were performed at Jefferson Lab, with image reconstruction simulations and gantry design at UF. Imaging system fabrication is underway at Jefferson Lab and integration of the system components will be performed at UF. Pre-clinical and clinical cardiac imaging studies will be performed at UF. In the next phase of the project, a positron emission mammography (PEM) system will be designed and built at Jefferson Lab. Physicians and scientists at USF will evaluate the clinical role and benefit of molecular imaging in breast cancer detection, diagnosis and treatment, specifically focused on the clinical role of dedicated positron emission mammography systems. This close-up photo shows the key elements of the detector head (approximate size is 10 centimeters by 10 cm by 10 cm), which will fit inside of a tungsten box. Photo: Greg Adams, JLab. Optical fluorescence and radiopharmaceutical imaging offer complementary ways of studying small animal physiology. A small, high resolution compact gamma camera has been developed and built at Jefferson Lab and integrated into a dual modality SPECT/optical small animal imaging system at the German Cancer Research Center (Heidelberg, Germany; Joerg Peter, PI). The key design features of the 10cm x 10cm field of view gamma camera are the use of a 2 x 2 array of flat panel position-sensitive photomultiplier tubes and a pixellated scintillation crystal array. A specially designed system of reflectors and mirrors built by the German Cancer Research Center permits simultaneous optical and gamma imaging with implicit image registration between the modalities. 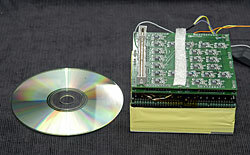 The optical detector is a high resolution cooled CCD camera. The optical and gamma subsystems are mounted on the same tomographic gantry. Initial small animal and phantom imaging studies have been performed to characterize the imaging system. A positron emission mammography/tomography (PEM/PET) biopsy device is being developed to detect suspicious breast lesions and then to guide needle biopsies of these lesions in women who have indeterminate mammograms because of dense or fibroglandular breasts. The PI of this NIH-funded project is Ray Raylman at West Virginia University (WVU). Jefferson Lab will design and build two sets of large-area PEM detectors that will be integrated into a rotating gantry at WVU. The detectors will incorporate the latest developments in gamma/positron imaging technology with flat panel photomultiplier tubes, pixellated scintillator arrays and fast front-end and data acquisition electronics. Jefferson Lab is also assisting in simulation and image reconstruction for this dedicated breast imager. Laboratory, pre-clinical and clinical evaluations of the system are underway or planned at Jefferson Lab and WVU. This false-color image of stem cells inside mice was captured by the cooled CCD camera/optical modality of the small animal planar imaging system developed for Case Western. Jefferson Lab in collaboration with Case Western Reserve University (Dr. Zhenghong Lee) is developing a system that provides fused planar radiopharmaceutical imaging, planar x-ray imaging and planar bioluminescent/fluorescence imaging in a single apparatus for small animal imaging. Jefferson Lab developed a high resolution gamma camera based on a large position sensitive photomultiplier tube coupled to a pixellated NaI(Tl) scintillator array with individual crystal elements 1.3 mm x 1.3 mm x 6 mm in size and 0.2 mm septa between each element (1.5mm pixel step). The gamma camera has an active area of ~10 cm in diameter and has been optimized for I-125 imaging. To acquire anatomical information we are using a commercial digital x-ray detector that provides a field of view of 5 cm x 10 cm. A cooled CCD based camera is utilized for the imaging of the bio-distribution of bioluminescence. All three imaging instruments are to be integrated into a single light tight / x-ray tight enclosure. The system is being used for several mouse studies such as Afp based liver cancer imaging, cystic fibrosis gene therapy, new peptide ligands targeting αvβ3 for angiogenesis and new small-molecule-based radiotracers for prostate and other cancers.